If you’ve been following this blog for awhile, you know that I’m a big fan of native plants. Each spring, I comb the woods and fields for the first budding Calypso orchids, starflower, twinflower, white fawn lily and other favorites. But I’m not a flower snob: I find all plants fascinating. When I recently got an invitation to tour an Orcas Island iris garden at peak bloom, I jumped at the chance. Like recalling the first blush of love, Charlie Carver vividly remembers when he first laid eyes on a wild iris while hiking in Colorado some 40 years ago. The graceful form, seductive petals and flirty colors stopped him in his tracks and changed his life. He dedicated himself to begin seriously studying and collecting a wide range of iris cultivars, and quickly became an expert on their history and propagation. When Charlie moved to Orcas Island, he brought his beloved irises, cleared space for a large garden and began expanding his collection. Charlie’s devotion to his plants is complete. He lives very simply so that he can pour his time and passion into his gardens. Nationally renowned among serious flower people as “Charlie the iris guy,” he’s currently Chair of the American Iris Society (AIS) National Collections Program where he’s on the leading edge of efforts to catalogue and preserve as many iris cultivars as possible. Charlie’s personal Orcas Island collection has grown to more than 1,600 varieties of iris. Many are rare specimens and more than half are considered historic, meaning they were introduced more than 30 years ago. His special interest is in dwarf iris. He collects both standard dwarf bearded iris (SDB) which are 8-16” tall and miniature dwarf bearded iris (MDB) which are 2-8” tall. What I expected to be a short tour of interesting plants turned into an entire afternoon immersed in the beautiful, exotic blooms, with Charlie providing an in-depth expert tour into the spectacular world of irises. Below are photos of just some of my favorite flowers from his collection. Click on the photo to see the cultivar name. Even captured with just a cellphone camera, which doesn’t do them justice, I think you’ll understand why these remarkable flowers have now become some of the island’s most fascinating and beautiful imports. Enjoy! 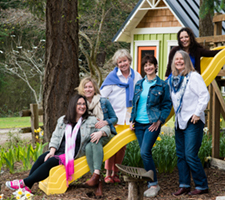 Looking to pursue your passion and live simply on Orcas Island? Contact me!